We know how difficult it can be to find a fully qualified and licensed electrician you can trust to get the job done right the first time. At Lightfoot Electrical, we pride ourselves on having built a team of experienced and highly professional Local Electricians. With a Master Electrician on board, we can ensure we have taken every measure to protect our customers. Lightfoot Mechanical is proud to be regarded as North Texas’ premier electrical contractor. With highly skilled electricians that have decades of experience behind them, our customers can rest assured that any electrical job will be completed efficiently and to the highest of standards. We offer a variety of electrical services for local homeowners from Aledo, right through to Burleson. 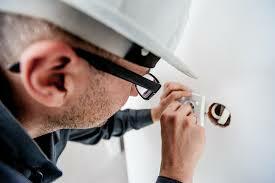 From small residential repairs to new constructions, remodels and maintenance contracts – our electricians do it all. We are available 24/7 so if you are facing an electrical emergency, just give us a call anytime. When our residential electrician arrives at your door, you can rest assured that they will come prepared to handle the job quickly and to the highest of standards. Our fully equipped vans and highly skilled electricians will respond swiftly and complete the job to a level where we know it will pass inspection. A fully licensed electrician in Weatherford, TX is equipped to handle any of your commercial building electrical needs at every level. With over 33 years of experience, we have come across pretty much every commercial job, ranging from minor repairs and installations to multi-million dollar new-builds. From experience, we know that no commercial electrical client is the same. We understand that every business comes with its own specific needs, which is why we work closely to come up with a solution that will fit in with your goals. Our electrical system will be created to insure safety and energy efficiency, so you get the most out of your investment. The smooth running of your home or business is essential, which is why we offer specially tailored maintenance plans to keep your electrical equipment running efficiently throughout the year. With scheduled tune-ups and electrical safety inspections, you will have the peace of mind that your electrical system will be in top shape to handle any seasonal changes. In order to guarantee your satisfaction, we ensure that every employee within out company follows a set of requirements. This involves everything from completing background checks, to ensuring professionalism and competency and instilling a dress code and personal appearance policy. This is our pledge of ethical and competent service, and we love to hear what Fort Worth, Weatherford and surrounding area homeowners have been saying about us in response. We take great care to insure that all customers are completely satisfied with their electrical repair or service.